The so-called Islamic State's gains have been reversed in just a few places in Iraq. One is the town of Jalawla, now held by Kurdish forces. Paul Wood returns to Jalawla after witnessing the fighting there over the summer. A Kurdish flag fluttered on top of a ruined building in the centre of Jalawla. It had been their military headquarters until demolished by an Islamic State (IS) suicide truck bomb. "Be careful of booby traps," said our guide from the Kurdish forces, the Peshmerga, "they left them everywhere, even in the walls." Jalawla changed hands several times in six months of struggle between the jihadists on the one hand and, on the other, a loose and antagonistic coalition of Kurdish forces, the Iraqi Army and Shia militia. The Kurds say the last battle, at the end of November, was decisive, pushing IS out of the town and out of the surrounding countryside as well. "The situation is quiet and safe," said the Peshmerga commander here, Mahmoud Sangawi. "We have cleaned 1,000 sq km [620 sq miles] of IS. There is no terrorist presence in the whole of the province." We saw some of the fighting, in June. Seventy-five pick-up trucks with foreign jihadists were heading for the outskirts of Jalawla. A Kurdish general told me that as he mustered his men to head them off. We waited in the centre of town but still found ourselves in the middle of a brief but intense firefight. We took cover in a basement with a small group of Peshmerga. For a horrible few minutes, it seemed as if they were surrounded. A fighter lay bleeding on the stairs, his face white as blood flowed from a leg wound. His comrades crouched and let loose volleys of bullets. One thought he spotted IS coming in through the back of the building. "There he is, there he is," he shouted, firing panicky Kalashnikov rounds. I assumed Islamic State were able to attack in the centre of town because the gunmen were local Sunnis already living in Jalawla. A large Arab tribe in the area, the Kerwi, had pledged loyalty to IS. The Kurds spent days on the telephone to the local tribal sheikh trying, unsuccessfully, to get him to change sides. IS in Jalawla and the neighbouring village consisted of 150-200 foreign fighters and 500 local Sunnis, said Kurdish intelligence. Jalawla today is eerily quiet. The streets were deserted when we visited - a few cats running in between the burned out cars. A bridge, built by the British in the 1920s, lay broken in half, blown up by the jihadists. There are no civilians at all in the town, just Kurdish fighters. When people did eventually come back, I asked the Peshmerga commander, Mahmoud Sangawi, whether Arabs who fought with IS would be allowed to return too. "We don't have a problem with them if they come back and ask for forgiveness," he said. But then he made a distinction between Arabs who had lived in Jalawla for generations and those moved there in the 1970s by Saddam Hussein. The more recent arrivals included most of the Kerwi tribe, whose sheikh had pledged loyalty to the Islamic State, he said. "We don't have a problem with the [longstanding] Arab population," he said. "We do have a problem with Arabs who were brought here. They supported the former regime. They supported al-Qaeda. Now they are IS." The "recently" transferred Arabs changed the balance of population in Jalawla and other towns just outside the "green line" marking Kurdish territory. 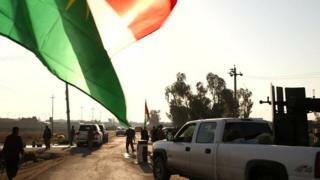 Preventing their return would restore a Kurdish majority in Jalawla. It, and other disputed towns, might one day be part of the independent state dreamed of by Kurds. "This land was Kurdish since the Ottoman Empire," said Cdr Sangawi, looking at the town and the desert beyond. For Kurds, the rise of Islamic State is an opportunity as much as a threat. On a dirt hillside overlooking Jalawla, the Kurds showed us makeshift graves left behind by the retreating jihadis. They contained the bodies of Shia men, women and children, they said. An IS prisoner had told them 27 people were buried there. "IS executed them," said a Kurdish fighter. "This is not the only place they carried out a massacre - there are others." It was impossible to verify that claim. But the stench of decaying bodies was overpowering. Dogs had tried to dig them up. Clothes and what looked like a human bone lay on the surface. The Kurdish fighters covered their noses and mouths and turned away. During the brief period of IS rule in the town, a Shia mosque was blown up and the imam shot, we were told. Now that the jihadists have been chased away, Shia militias controlled by Baghdad have moved into the area. So camps near Jalawla are full of Sunni Arabs. The camps are squalid, with rivers of sewage running between the rows of tents. But fear of revenge attacks by the Shia militias keeps people there. The militias were looting empty homes, they said - at least Islamic State had not done that, some added, quietly. Jamila Ahmed, a 61-year-old grandmother, was looking after a sick husband in one of the tents. They had fled their homes at the start of the fighting because of government airstrikes and Kurdish artillery aimed at the jihadists. "We're afraid of the Islamic State and the Shia militias. We are poor and simple people. We just want to be safe," she said. "We want to go back to our homes. We want the Iraqi army back in charge." But the Iraqi army - and the Iraqi State - are scarcely to be seen. Kurd and Arab, Sunni and Shia - the violence brought by the jihadists has shattered this country along its many fault lines.